PHILADELPHIA – The battle between the human immune system and long-term, persisting infections and other chronic diseases such as cancer results in a prolonged stalemate. Over time battle-weary T cells become exhausted, giving germs or tumors an edge. 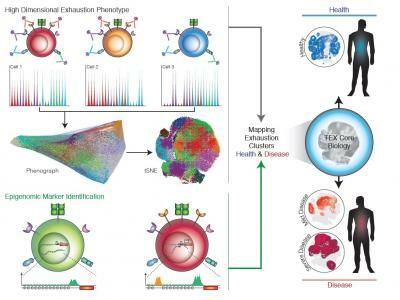 Using data from multiple molecular databases, researchers from the Perelman School of Medicine at the University of Pennsylvania have found nine distinct types of exhausted T cells ("Tex"), which could have implications for fighting chronic infections, autoimmunity, and cancer. They published their findings in Immunity this week. Wherry's lab has spent the last decade describing these populations of fatigued cells. Overall, when normal T cells become exhausted, they develop defects in their germ- and tumor-fighting capabilities. Tex also express inhibitory receptor proteins on their surface that stall key biochemical pathways, provoke changes in control of gene expression, alter metabolism for making energy to fight infections and tumors, and prevent development of optimal immune function. Because of the clusters' relationships to specific disease type and progression, the team's aim is to use the signature of a Tex cluster to assess a patient's overall immune health and likelihood of responding to a certain therapy. "We want to be able to select and tailor immune therapies according to a patient's exhausted T cell pool and its individual characteristics," Wherry said. These studies were led by first author Bertram Bengsch, a postdoctoral fellow in Wherry's lab. Other coauthors from Penn included Takuya Ohtani, Omar Khan, Sasikanth Manne, Shaun O'Brien, Ramin Sedaghat Herati, Alexander C. Huang, Kyong-Mi Chang, and Steven M. Albelda.